Most get their first epileptic seizure before the age of 10. Danish Care Technology is not capable of providing advise on epilepsy itself. Please contact your GP or Epilepsy Action if you have any questions. Only in rare cases do tonic-clonic seizures cause serious injury. Prolonged seizures are particularly risky, as the person will have difficulty breathing during the seizure. Such seizures must be detected so they can be stopped with medication. Even though the typical seizure does not cause lasting damage, the seizure is an unpleasant experience for the child. Especially if the parents do not discover the seizure, thus leaving the child alone during and after the seizure. The risk is particularly high at night when the family is asleep. Moreover, there is the fear for rare and dangerous seizures such as status epilepticus, and even worse, the risk of SUDEP. No one can predict when a seizure will happen. This uncertainty puts parents under tremendous pressure. Even nights with no seizures can reduce the sense of security as well as cause reduced sleep quality for the whole family. If the child has generalised tonic-clonic seizures, an epilepsy alarm can be a solution. The study: “Impact of pediatric epilepsy on sleep patterns and behaviors in children and parents” investigates how epilepsy in children affects the parents’ quality of sleep. Data is taken from the study "Impact of pediatric epilepsy on sleep patterns and behaviors in children and parents"
The study included 105 families with a child with epilepsy and 79 control families. The children were between 2 and 10 years old. Both the sleep of the children and the parents were investigated. The study shows that parents often sleep in the room or in the same bed as the child with epilepsy. The benefit of co-sleeping is that parent can remain close to the child, but co-sleeping has its price. 64 % of the parents in the study began to sleep in the same room as the child after the child was diagnosed with epilepsy. Of these, 62 % of the parents described decreased sleep quality. How does the Epi-Care 3000 work? 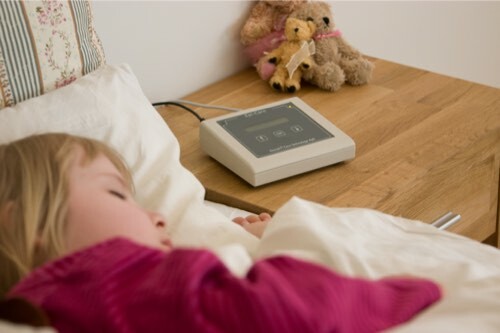 Epi-Care 3000 consists of a sensor that is attached to the mattress of the child’s bed. 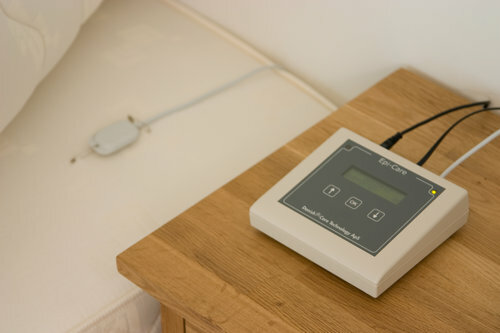 The sensor transmits data to the Epi-Care device which measures movements in the bed. If the movements are similar to those caused by a tonic-clonic seizure, Epi-Care 3000 sends an alarm immediately. Danish Care Technology also produces Epi-Care free and Epi-Care mobile, but we do not recommend these types of alarms to children under the age of 10. One major reason is that children has less muscle than adults. This means that their seizures are smaller and require more precision to measure with certainty. The sensor ofEpi-Care 3000is also much more sensitive than our other alarms. It is more effective to have an alarm that works day and night, so why can’t a child use an Epi-Care mobile? This is because children have less muscle mass than adults. Therefore, the vibrations occurring during seizures are also weaker. A more sensitive sensor technology is needed to measure seizures in children. A wristband is constantly in motion, so a sensitive alarm will also get many false alarms from everyday movements. A bed, by contrast, stands still and the child is lying still while sleeping. Here it is easy to attach a sensitive sensor. The 10-year limit has been set in cooperation with physicians, as part of our clinical test of wrist-worn sensors. Epi-Care 3000 is of course also used by adults. The bed sensor is a safe and gentle way to monitor epilepsy at night, without using invasive monitors such video surveillance.